The honeybees had only built 7 or 8 combs, and the combs were only about 8 inches from top to bottom, so I knew that the bees had not been in the cubbyhole very long…most likely less than a couple of weeks. From the looks of the nest, I could tell it was probably a small swarm to begin with. Using my Owens Bee Vac, I gently vacuumed the bees off the combs. By the way, I highly recommend the Owens Bee Vac. You can get one from the good folks at Brushy Mountain Bee Farms. After vacuuming off the bees, I detached the combs from the top of the cupboard and laid them aside. I wanted to keep them since they were full of larvae and baby bees. After a bit, all the comb was laid out, and the bees were in my bee vac. I scraped the inside of the cupboard with my hive tool to remove any beeswax that was left. Then I packed up my tools, put the comb in a bucket, and drove home. 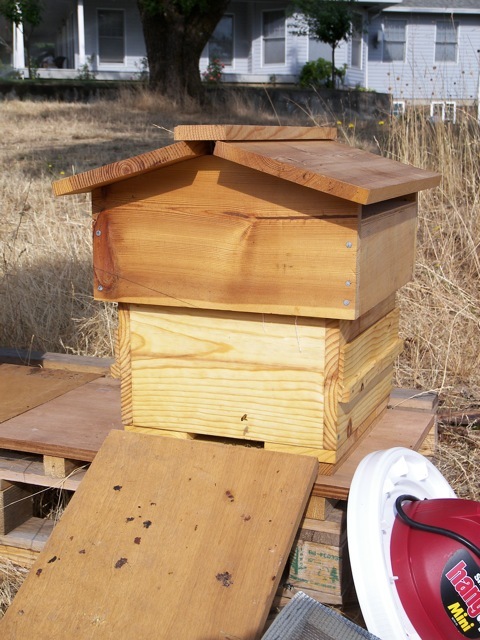 At home, I took a Warre hive box and removed some of the top bars. I have them tacked down with very small nails so they are easy to remove. I took some rubber bands and attached the comb to the top bars by stretching the bands around the comb and the top bars. The bees will affix the honeycomb to the top bars with wax. Then they will chew the rubber bands apart and throw them out the hive entrance. After I set up the Warre hive, I layed a board onto the hive entrance. Then I dumped all the bees from the bee vac onto the board. It was amazing. The bees literally ran up the board into the hive. They smelled their own wax and baby bees and ran towards the smell. They formed what looked like a river of bees flowing up into the hive. It was pretty neat. I will probably need to feed this new hive with some honey to get them through the winter. Their stores need to be around 20-25 pounds of honey and pollen in order to survive the Colorado winters. I checked them just today, and they are happily pulling in pollen and nectar…a good sign that the queen is alive and well. It looks like the honeybees are happily adjusting to their new home. 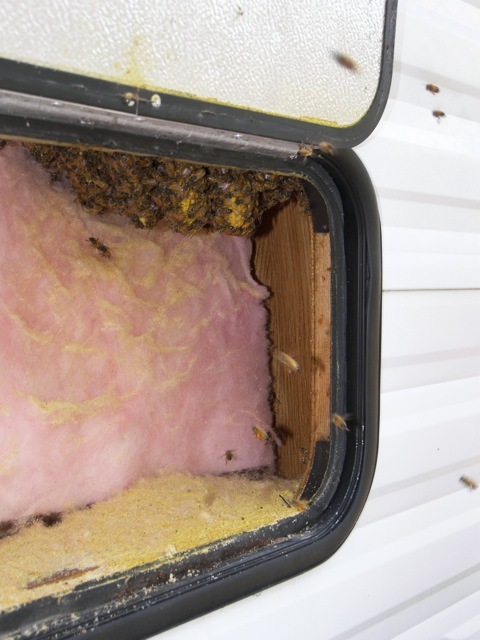 This entry was posted in Beekeeping Advice, Nick's Bees and tagged honeybees in an RV, HowTo, Installing a Swarm, swarm removal, Warre Hive, Wild Honeybees. Bookmark the permalink. bug_girl – Thanks for the kind comment!